Since SHOUT! shook its way into the New York Musical Theatre Festival, the musical celebration of the 60’s has become a true international smash hit, entertaining audiences the world over with the infectious and soulful pop anthems and ballads that helped grow the female empowerment movement. SHOUT! was launched by Lang Entertainment Group along with Amas Musical Theatre, in 2004, with a specially-requested stage reading that officially opened the inaugural New York Musical Theatre Festival. Indeed, it was these three sold-out presentations at the Festival and the phenomenal response from both industry professionals and consumer audiences that hinted at and cemented the unstoppable ride on which the show would soon embark. Industry stagings and workshops followed, shaping the show for its out-of-town try-out, a sell-out at the Kravis Center in West Palm Beach, FL, in June 2006. In July 2006, SHOUT! returned to New York – this time taking up a 6-month residence at Off-Broadway’s Julia Miles Theatre, where audiences cheered and critics raved. Lava lamps burned brightly as Good Morning America dubbed SHOUT! 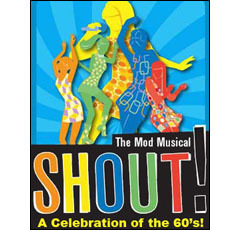 “the hottest new musical in New York!”Following its popular New York run, the five fabulously mod girls of SHOUT! packed up their polyester miniskirts and knee-high white boots and hit the road for a triumphant national tour, wowing audiences from Ft. Lauderdale to Chicago to Hawaii. International productions have entertained audiences in London , Tokyo , Seoul , Kuala Lumpur , and on the high seas aboard Norwegian Cruise Lines. And the SHOUT! phenomenon isn’t letting up anytime soon with licensed productions scheduled throughout the world for years to come. Thousands of miles, gallons of hairspray and countless renditions of “Son of a Preacher Man” later, SHOUT! is still going strong, certain to keep delighting audiences, with its dynamic blend of classic tunes, tongue-in-cheek wit and female empowerment, for years to come – an undeniable success story. SHOUT! is co-created by Phillip George and David Lowenstein, Lowenstein choreographs and George directs, with mod musings & groovy gab by Peter Charles Morris and Phillip George. David Lowenstein choreographed Howard Crabtree’s Whoop-Dee-Doo! among many other credits. Phillip George has directed 14 editions of Forbidden Broadway, Howard Crabtree’s Whoop-Dee Doo! ((Drama Desk Award, Best Musical Revue), and was Associate Director on When Pigs Fly. Peter Charles Morris and PhillipGeorge have collaborated for 15 years on projects in New York and in London including Whoop-Dee Doo! The first edition of SHOUT! appeared on stage at the Duplex in New York in 2000 and then transferred to London’s Jermyn Street Theatre where it was nominated as Best Musical by WhatsOnStage.The design team is David Gallo (scenic design), Phillip Heckman (costume design), Jason Lyons (lighting design) and Tony Meola (sound design). Musical arrangements, orchestrations and direction are by Brad Vieth.